Read the latest news about blacks and abortion on The Root. It's safe to say that few things shock New Yorkers. But a new anti-abortion billboard erected in New York City's SoHo neighborhood has created a firestorm of controversy. 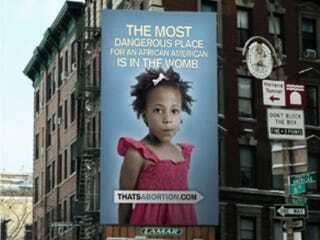 It depicts the image of a pensive 6-year-old girl in a red sleeveless summer dress beneath these ominous and portentous words: "The Most Dangerous Place for an African American Is in the Womb." The billboard — placed at the bustling intersection of Sixth Avenue and Watts Street by the nonprofit pro-life organizations Life Always and thatsabortion.com — is about half a mile from one of three Planned Parenthood locations. Those facilities jointly reported nearly 17,000 pregnancy terminations in 2010, according to Life Always. A Planned Parenthood spokesman confirmed that number, adding that about 92 percent of terminations were conducted during the first trimester. Twenty-eight percent were medication-induced abortions performed within the first nine weeks. Planned Parenthood and other pro-choice advocates have lashed out against the startling advertisement. In a prepared statement, Planned Parenthood called the billboard "an offensive and condescending effort to stigmatize and shame African-American women while attempting to discredit the work of Planned Parenthood." The Rev. Al Sharpton and New York City Council member Letitia James had been planning to hold a press conference in front of the billboard Friday afternoon. A statement released by Sharpton's office earlier today said that the billboard "sends a message of racial profiling and discourages a woman's right to choose." However, in a rapid turn of events, a message sent by Sharpton's office later in the day said that the activist "salutes the decision of Lamar Advertising to pull the billboard." The press conference was also canceled. "The billboard has come down," the receptionist of the Baton Rouge, La.-based company confirmed for The Root. She added that the company spokesman, Sal Kilshaw, vice president of government relations, was traveling and could not be reached for comment. Roger Rathman, a spokesman for Planned Parenthood of New York City, applauded the decision, saying, We are "pleased to hear that Lamar Advertising has listened to the thousands of voices of outraged New Yorkers and decided to take down the offensive and reprehensible billboard." The mother of the child depicted in the ad had also been on the offensive. Tricia Fraser told Fox 5 News on Wednesday night that she wanted the billboard taken down. The image of her daughter Annisa was a stock photo, and not taken specifically for the purposes of being used on the billboard. Life Always did not respond to a message left by The Root. But in a prepared statement released early yesterday, the group said that the billboard was placed in honor of Black History Month. "We celebrate our history, but our future is in jeopardy as a genocidal plot is carried through abortion," said Life Always board member Stephen Borden. "We have seen the heartbreaking effects of opportunists who happen to be black abortionists perpetrating this atrocity. It's not just babies who are in danger; it's also their mothers and our society at large." Planned Parenthood said that it also provides care to more than 50,000 men, women and teens each year. Services include cancer screenings, STD testing and treatment, contraceptive consultations and ob-gyn exams. When the billboard initially popped up in New York City, all eyes were on Ryan Bomberger, co-founder of the Radiance Foundation, which is the progenitor of the nationwide anti-abortion billboard campaign toomanyaborted.com. Bomberger told The Root in an e-mail that while he supports the effort, he is not involved in the SoHo billboard campaign. His organization does plan to head to New York because of the city's alarming abortion rate, he said. The most recent stop was in Los Angeles, known as the "abortion capital" because of the large number of terminations performed in the city's 424 abortion clinics, he said. "We believe any approach to the epidemic issue of abortion — especially in New York, where 1,489 black babies are aborted for every 1,000 black babies born — should always affirm the beautiful intrinsic value of women, men and children, born and unborn," Bomberger said.